It's August -well August 4th. | A.B.E. Remodeling, INC. It's August. Well by now it is already August 4th. 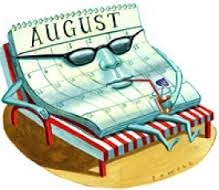 I missed the first but however, even though it's 4 days into the month, I want to wish you all good days in August. It's soon back to school for all the "kiddos". You still have a bit of time to get some vacation days in or other day activities. For those of you who don't need to get the children back to school, then you have time to fit in other adventures. You know what we're saying. In any event, we managed to get away for a week of vacation. We spent it at Lake Raystown. It's a beautiful lake. We have beautiful weather and it was a very nice vacation. The hardest part is coming back, come on- I know you all experience that. Anyway, now we're playing a bit of catch up at the office. We're busy busy busy - thanks to our wonderful clients. We have the hammers hammering, the saws cutting, and the tools going wild to get projects done. We're doing full kitchen remodels, several full bathroom remodels, seasonal additions and we're also working on those smaller projects that are needed; like putting up shelves. As said before "Life is good". Can you believe how fast the months have gone in 2015. Time flies....get out there and don't let these days slip by without enjoying them. Happy August everyone!